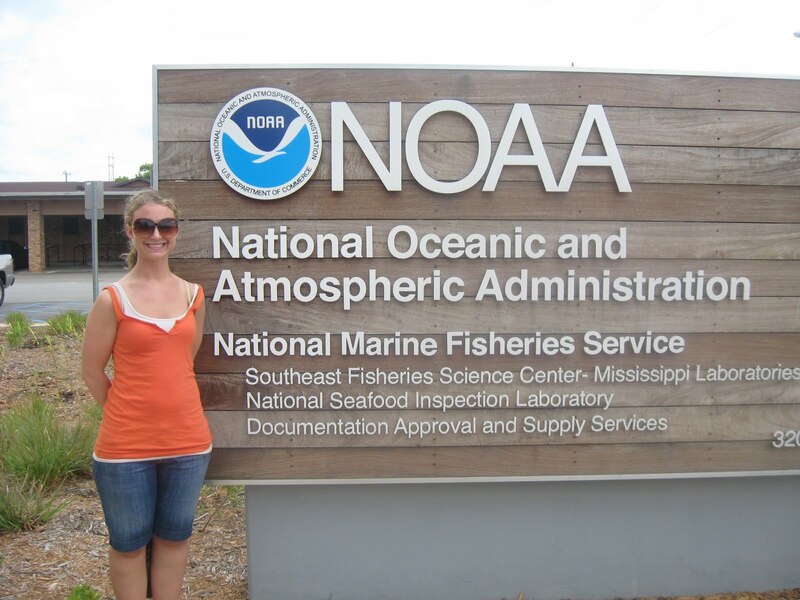 Yesterday, Anne-Marie and I were given a tour of the NOAA facilities in Pascagoula. In the new building they house several different divisions; Southeast Marine Fisheries Unit, Seafood Inspection and Documentation and Approval Center. Kevin Rademacher our Chief Scientist showed us around. The labs in the Marine Fisheries unit take what is being done on the vessels and use it for research. They run many different types of research on the ships. 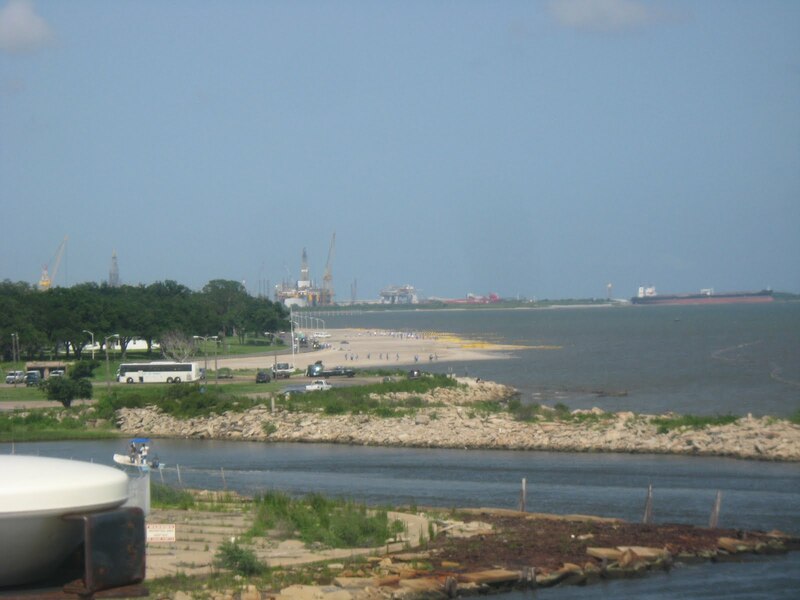 Beside the Pisces, there are two other ships that are run out of Pascagoula; Oregon II, and The Gordan Gunter. On one of the floors were the Seafood Inspection labs. They bring in fish from different areas and test it. 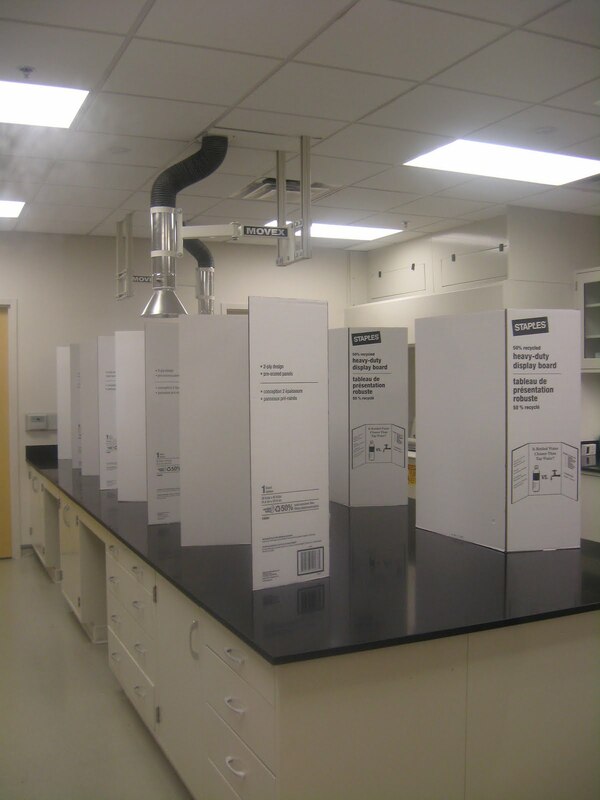 In one lab they had a set of partitions up which were the tasting areas. An example of what they have done in the past that Kevin gave us was a restaurant bought some red snapper. They brought it to the lab where they cooked in clear Pyrex containers then they smelled, checked the consistency, and tasted the fish. They discovered that the fish was not really snapper! Right now due to the oil spill they are mainly focusing on the fish that we bring in on our survey. We are required to save 10 fish out of every trap we bring up so that they can have a baseline testing of fish from an area before being it has been impacted by the oil spill. Another floor of the building is the science labs. We walked through the plankton lab, where each person had their own station with a computer and a high powered microscope. They had several different samples out that were labeled. Just like our trip in the 6th grade they used nets with different size holes to catch different types of plankton. Another lab was called the Age and Growth lab. 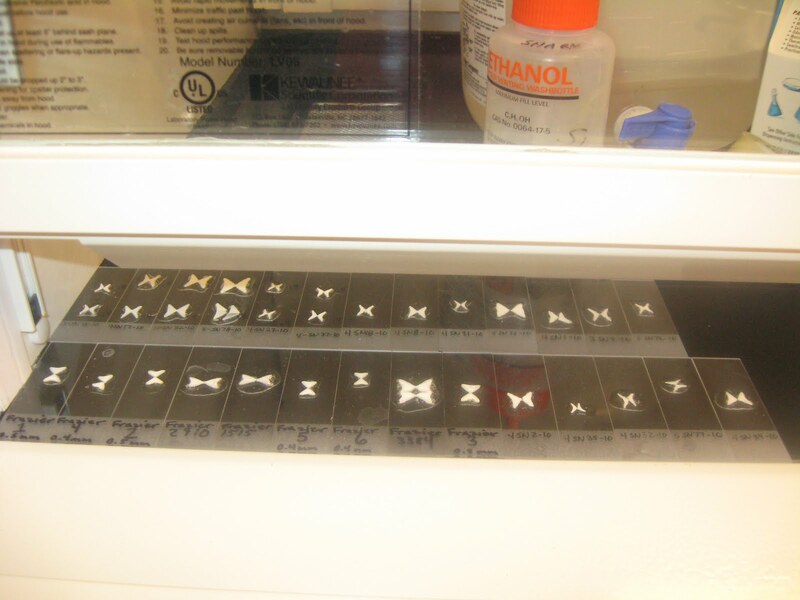 Here is a picture of shark vertebrae they were preparing for aging. Today we are not working on the Reef Fish survey. Our Chief Scientist Kevin Radechamer wanted to do some mapping of an area called Sackett Bank which is south of Louisiana. The mapping they had done before did not give them an accurate depiction of the sea floor and now they have new technology. They are using an acoustic system called ME70. This system has 27 beams that run in a 120 degree swath. With the technology they had before they were only able to see 1 meter “bumps” on the surface now they can see to within a ½ meter. 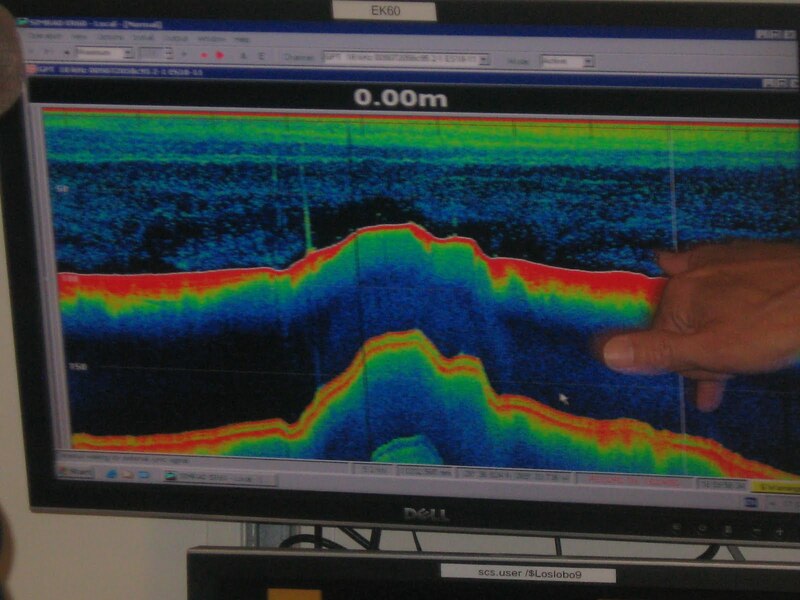 The white line that you can barely see shows the surface of the seafloor. The red is sand or mud that is on the bottom, as the red gets thinner and darker it is showing the harder rock that is below. As the sound waves go down they bounce back and we are able to see any see critters that are down there. Most of what you can see in the picture is plankton but occasionally you can see fish as well. This is a before and after shot of the two types of mapping. In one the map technology was guessing what was in between the bands. 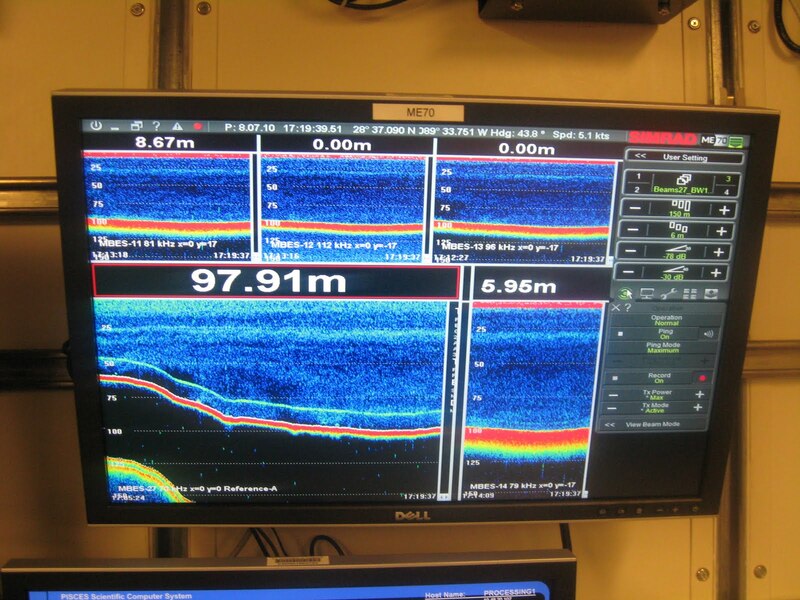 This information will give scientists new information about the seafloor. I’m finally here! The last two days were very exciting. When we got to the ship it was 7:00ish and most of the ship’s crew were out and about, so we had the ship to ourselves. We wandered around taking pictures and investigating. I only went on an “adventure” (lost my way) twice. Everywhere you turn there is a doorway, hatch or stairwell. I was awed by the amount of technology that they have on board. There are computer labs on almost every floor. I am envious of the color printer! Ann Marie and I are sharing a state room. It’s fantastic! The crew takes pride in what they do and it is very obvious, our beds even had mints on them. We have a T.V. and an internet connection in our room. I don’t plan on spending a lot of time in there but it is pretty fabulous! We left port yesterday and headed south. The scientists and teachers stayed on the fly deck as we moved closer to the Gulf. As we were leaving you could see what impact the oil spill has had on the Mississippi Coast and on the Barrier Islands. As a result of the tropical storm over the weekend there were some pretty high swells. We had waves from 6 to 8 ft. The ship was rocking pretty badly. After our Safety Meeting where we were told about all of the safety precautions and the rules. No matter where you go there are rules. Including.. No wearing tank tops to the galley and NO sitting in the captains chair. 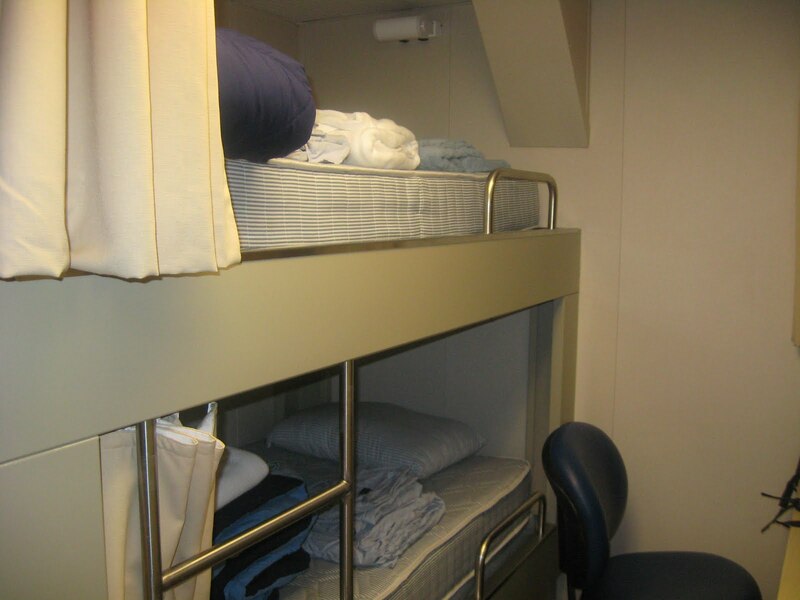 After the safety meeting the rolling was beginning to get to us so Anne Marie and I took to our bunks. I didn’t get sick! I did however go to sleep at 7:30. Today we have spent most of the day wandering around the ship and talking to the many different crew members on board. Oh.. and we had a fire drill. The fire drill was a lot like having one at school, the bell rang we walked to our area and then we sat for awhile. The next drill was much more exciting. 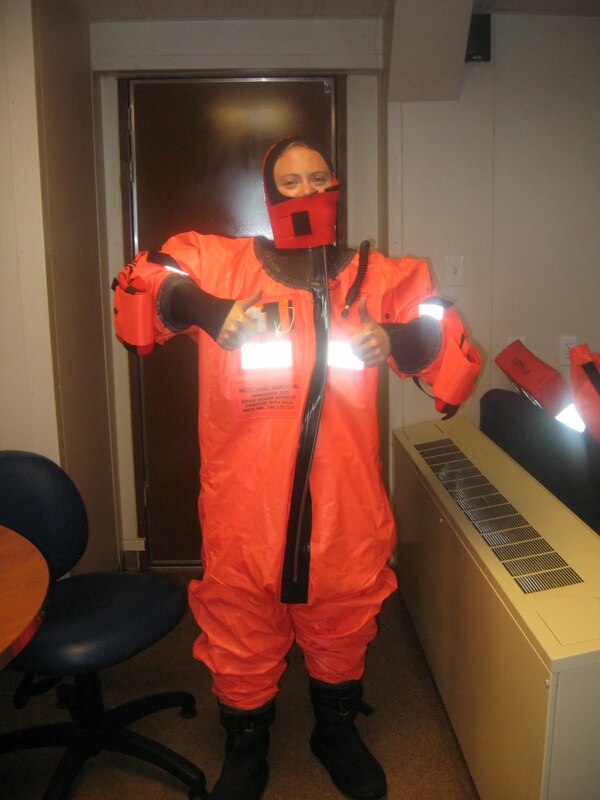 We had an Abandon Ship Drill! We had to grab a long sleeve t-shirt, a hat, pants, our Gumby suit, and a life jacket. It was a lot of stuff to carry with us! Everyone met out on the deck and I was introduced to Chief Marine Engineer Garrett who would be in charge of getting me where I needed to be in an emergency. As a first timer I was required to get into my Gumby suit. Yes, for those of you old enough to remember they are named after Gumby and Pokey. This would definitely not be my choice of a fashionable outfit. To get into it you have to lay the suit down on the ground and climb in like a sleeping bag. Then you zip it up! 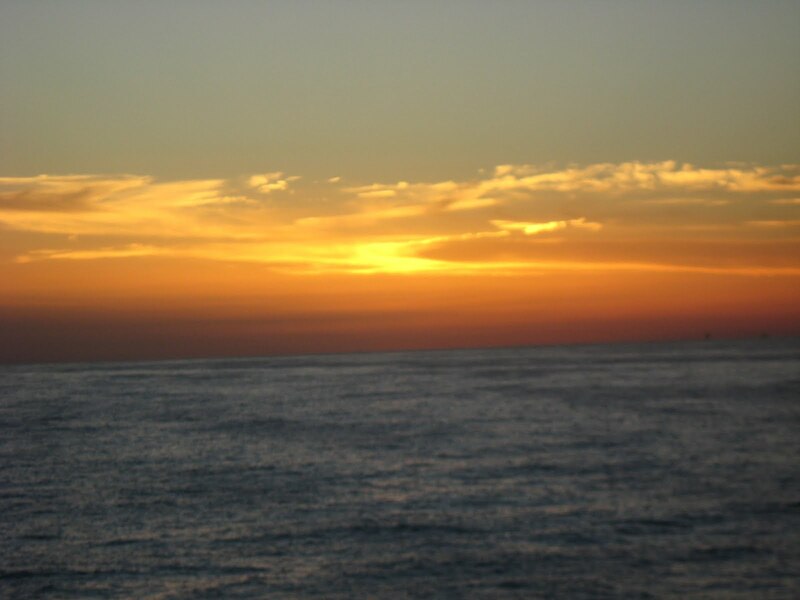 Everywhere you look in the Gulf you see oil rigs or tankers moving away or to an oil rig. We passed the disaster site this morning but we were 9 miles away so we did not see any oil or much of anything. In fact I haven’t seen oil yet, which is a good thing. The interesting thing that has come about for our trip as a result of the spill is the two bird experts, Scott and Ron. The birders were hired to look for pelagic birds, those that spend most of their lives at sea. Fish and Wildlife hired one, and the other is here for BP. They are looking to see if any pelagic birds have oil on them or if they find any dead birds. So far, in the four hour s they watched this morning they saw 11 birds. Listening to them talk has been fascinating! This was the sunset tonight. I’m heading in with tea in hand to try and upload the rest of my pictures. I’m ready for tomorrow! Kevin said we will start a half hour after sunrise so I’ll be up bright and early! Let’s do it! Bring on the giant fish and things for me to get dirty with! 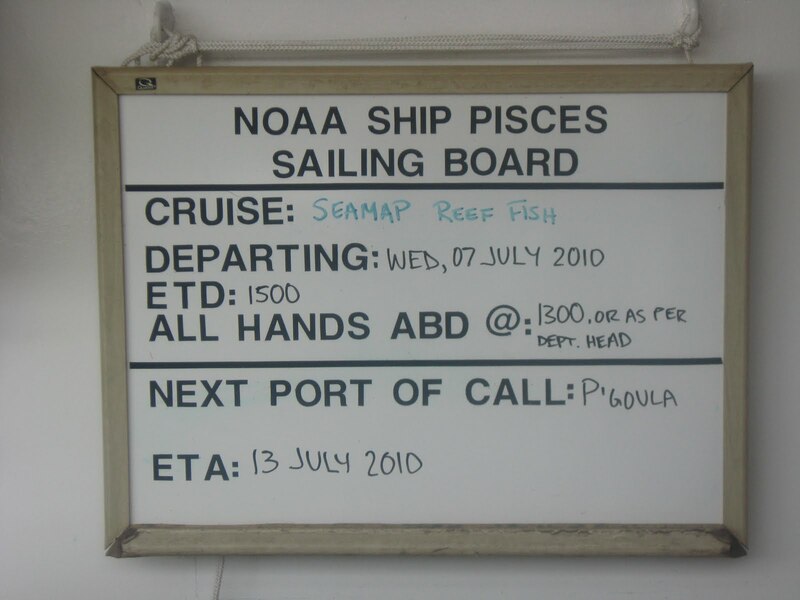 This entry was posted in 2010, Elizabeth Warren, NOAA Teacher at Sea and tagged Pisces, reef fish, safety, seafood inspection lab, Southwest Marine Fisheries Building, stateroom. Bookmark the permalink.